Think hydration — and you probably think water, the body’s essential fluid. But did you know you can eat your H2O too? That’s when you choose foods that are high in water content. 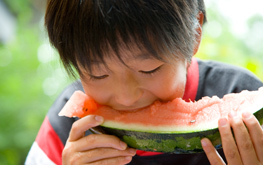 For example, some varieties of fruit and veggies are more than 85 percent water. On hot days, these foods — along with other fluids — can help you stay hydrated. And there’s a bonus: Water-rich fruits and veggies can also help replace key minerals (electrolytes) — which your body sheds when you sweat. Fruit soups. Strawberries, raspberries and cantaloupe puree nicely. See “Chilled melon soup” for a recipe to try. Staying hydrated is important, though. So carry a refillable water bottle with you — and sip from it throughout the day. Don’t wait until you’re thirsty. Bored with the same old water supply? Give it a twist with a wedge of lemon or lime — or a splash of 100 percent fruit juice. Be sure to wash your water bottle daily. To learn more about safety in hot weather, visit the Centers for Disease Control and Prevention website at cdc.gov. You can also check the weather and heat index in your area — and see heat advisories — at weather.gov. In hot weather, do keep an especially close eye on older people, people with health conditions and young children — and make sure they stay hydrated. They’re at the highest risk of heat-related illness. *Hydration needs can vary — based on health conditions you have and medications you’re taking. Talk with your doctor about what’s right for you.